According to the Wartski catalogue entry, this heraldic eagle was made as a gem-set hair ornament, or aigrette, for Empress Elizabeth Petrovna (1709-1761), the daughter of Peter the Great. 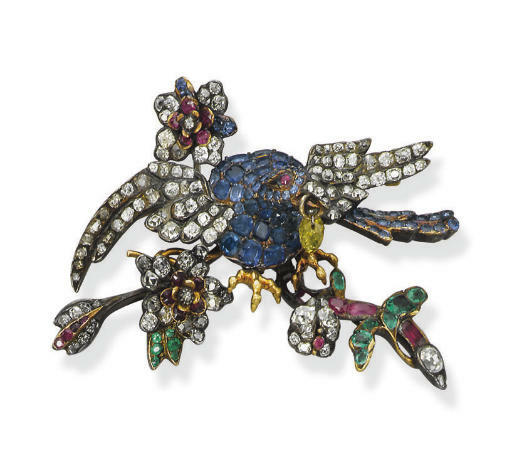 Fersman describes it as an 'aigrette in the form of an eagle' and 'an elegant example of goldsmith's work'. The survival of an eighteenth century jewel is a rare enough occurrence, with most jewels of the period broken up for the gemstones and remounted in more contemporary styles. However, the appearance of two such jewels (this and the following lot) with a recorded provenance to the Imperial Russian Jewels, one of which was created for an Empress, is extremely unusual.